Hello everyone, dear readers. Today, in this material, I will tell you how you can, in a simple way, save contacts from your iPhone mobile phone to a personal computer. To do this, you will need to use the free program from Apple - iTunes. So, let's get to work. For full-fledged work, you need the following things: the iPhone itself from which you have to copy contacts to a personal computer, a USB cable to connect your smartphone to a personal computer, iTunes, it is with the help of it that we will copy. 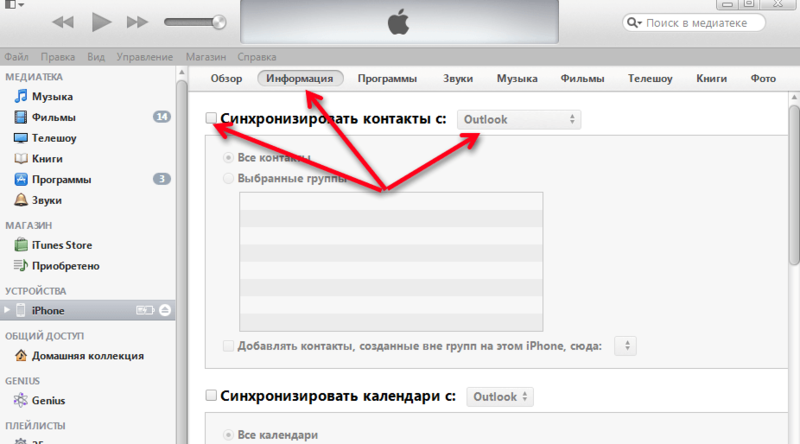 In order to complete the copying of contacts you need to go down to the bottom of the page and click the apply button. After a short time, the contacts will be copied to your personal computer in the program for storing contacts. Thus, you can easily and quickly save contacts from your iPhone mobile phone to a personal computer. Of course, there are other ways to copy, but this is the most simple and effective. After all the above operations, the saved contacts can be found in the program into which you made the export of contacts from your iPhone mobile phone. Today I have everything, if you have any comments, additions, or just an opinion, you can leave them in the comments to this post. To do this, you can use the comment form from the popular social network VK, located below. I will also be grateful if you share these materials in your accounts on social networks. To do this, you can use the button below this text. Restoring contacts from an iPhone backup can come in handy when you lost or sold the device, and the backup remained in iTunes.